Solving society's biggest problems isn't easy, but it can be done. 100&Change is a MacArthur Foundation competition for a $100 million grant to fund a single project that will make measurable progress towards solving a problem. Applicants must show evidence for how they will solve the problem, demonstrate that they're capable of carrying out the plan and explain how they'll sustain results after they've exhausted the grant money. We were so impressed with the proposals - which range from eliminating needless blindness to educating children displaced by conflict - and we knew you would be too! 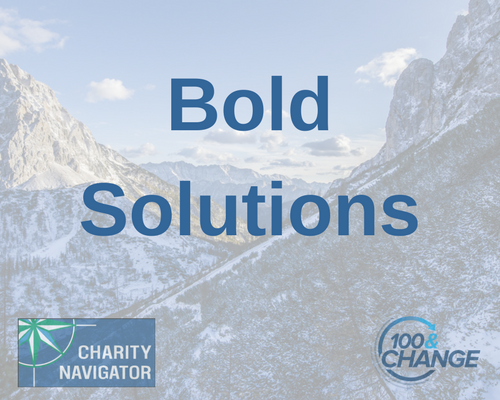 So, we've worked with with the MacArthur Foundation to bring you this selection of 100&Change proposals from highly-rated charities. Watch their videos to learn more about their bold proposals. Once you find an inspiring project, be sure to click through to the charity's page on our site where you can follow it and donate to it.